The theme of the 2018 state conference of the peak body for state school parents in Queensland, P&Cs Queensland, was a perfect entrée for powerful conversations about winning fair funding for quality state schools. One issue often ignored by our critics is that the Gonski and Fair Funding Now! campaigns are student focused. Enhanced resources in state schools go directly to the benefit of students and their learning. Parents, especially those involved in their P&C, know that schools often struggle to support students due to a lack of resources. Many people think of fundraising when they think of P&Cs, indeed, the conference had many stalls from providers of fundraising services. How great would it be if our state schools did not need to run another pie drive or fete to seek community contributions for essentials in schools. That is much of what our Fair Funding Now! campaign is all about. The QTU took its parent engagement strategy to a new level through sponsorship of the recent conference. Bringing together more than 500 passionate parents, and a few school leaders, this conference provided a forum for deep discussions on how parents and schools can build on their natural affiliations, parents as first teachers and partners in education, to maximise the successes of individual students and the public education system as a whole. The 2018 P&C conference theme blended perfectly with the campaign for Fair Funding Now!. The five key areas of disadvantage in education were identified and addressed through the original Gonski report in 2011, which focused on delivering resources to schools to ensure that every child has the maximum opportunity for success in education. In short, that every child has every chance to achieve to their potential. QTU Officers spent two fulfilling days having personal conversations with hundreds of parents and gaining commitments for almost 200 new supporters for our campaign. Many P&C leaders committed their schools to discussing the materials relating to the campaign and recruiting still more parents to become supporters. As a part of the broader community campaign, including market stalls, door knocking, visibility events and social media activity, direct engagement with parents will only lead to enhanced parent participation in the Fair Funding Now! campaign and growing calls for the current funding system to be changed for the benefit of all students in state schools. A special shout out to the P&C and principal of St Lawrence State School for their win in the Commonwealth Bank P&C of the Year award. An inspiring story of success for a small school in a small community. 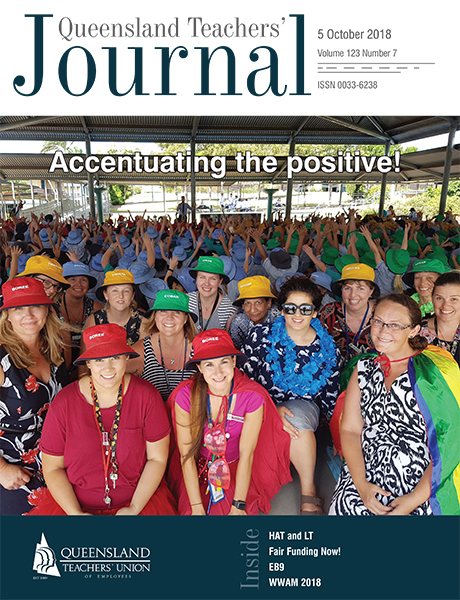 Look out for a story on this in a future edition of the Queensland Teachers’ Journal.